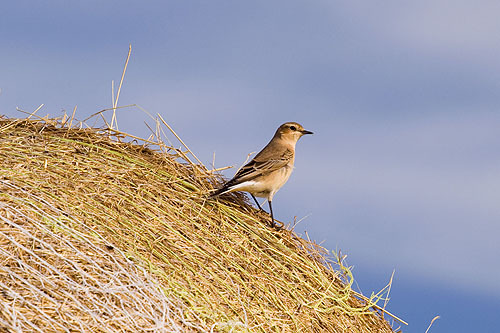 "Oenanthe Oenanthe" / Summer Visitor - Passage Migrant / Perching on a Straw Bale near Ceibwr Bay / A bird of open rocky . habitat / Flashes of white every time it moves . Nest - a grass lined hole in ground / stone wall / burrow . 2 Broods , 5 - 6 eggs , Incubation 14 days , Fledge 16 days .